Sometimes when you are browsing at the bookstore, you find a hidden treasure. I was wandering my local Barnes & Nobles as I had some time to kill and they had a book in their new science fiction and fantasy section entitled, The Immortals by Jordanna Max Brodsky. I know I am not supposed to judge a book by it’s cover but the title had my attention. I picked up the book and read the back blurb. I have mentioned repeatedly that my geekdom has its beginnings in the faraway past with my first reading of Bulfinch’s Mythology in the elementary school library. This book tags those feels so hard that there was no way that I was not going to be reading this book. The Immortals is my Jam! Jordanna weaves the tale of Selene Disilva. Selene Lives in Manhattan and works as an investigator. Her clientele is of a particular sort. She takes job where women are being abused and exploited and tries to give these women a chance at a better life. The book opens as Selene waits for her latest client’s problem boyfriend to show up. As the confrontation unfolds we get to watch as things go south but Selene gets lucks and is able to survive the encounter and ensure that, at least for a time, her client will not be abused further by her boyfriend. As Selene returns home, she laments the ever encroaching years that have inexorably sapped her strength and vitality. Unlike mere mortals, her years are numbered in the thousands. On an early morning walk to exercise her dog, Hippolyta, Selene discovers the body of woman who has been murdered. On closer inspection, the victim has been dressed in the raiment of someone who has participated in an ancient greek rite. It is then we learn that Selene will not allow this death to go unavenged. She will once again take up her mantle as the protector of the innocent. Even if she will not take up her ancient name, Artemis. The Immortals is a wonderful mix of mystery, suspense, romance, and exploration of greek mythology. Jordanna takes the reader on a trip through New York City with Selene as she tracks down the new cult that has started murdering women in her city. Jordanna’s descriptions are evocative of the thrumming energy that is New York City yet does an excellent job of linking these sites to the ancient rite that is unfolding. The complex relationship between Selene and the Theo, a professor of classics and mythology. Watching these two struggle to find a way to connect across the gulf of years that separate them was something that was heart wrenching and endearing in turns. Jordanna’s use of the Eleusinian Mysteries, different telling of the greek myths, and intriguing viewpoint on the cosmology of the gods of Greece was something that I loved learning about throughout the book. I loved The Immortals. Jordanna Max Brodsky has created a wonderful tale full of greek myths, modern relationships, and historical research. These are things that don’t sounds like they would combine to create something so spellbinding but Jordanna makes it look easy. The characters are both human and mythical without ever crossing that line to make the characters something that was not relatable. Jordannna weaves in history, both ancient greek and geographical in a fashion to create an even more engaging story. The underlying Eleusinian Mystery which burbles up within the story is both tense in how it plays out but fascinating from the standpoint of how myths evolve. The afterword and acknowledgements that speaks to these historical points was a lovely touch. 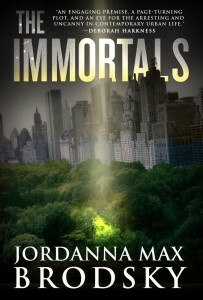 If you are a fan of urban fantasy, paranormal romance, or mythology in general, The Immortals is a book you need to add to your to read list. Four bear paws out of four. I can not wait for the next book in the series! Gen Con 2016 is only a few months away! One of the things that I look forward to at Gen Con is the Orc Stomp 5K. It is a walk/run that is held early in the morning on Friday and runs through White River State Park that is adjacent to the convention center in Indianapolis. the event is a way for geeky gamers to get together and have some fun physical activity during the best four days of gaming. 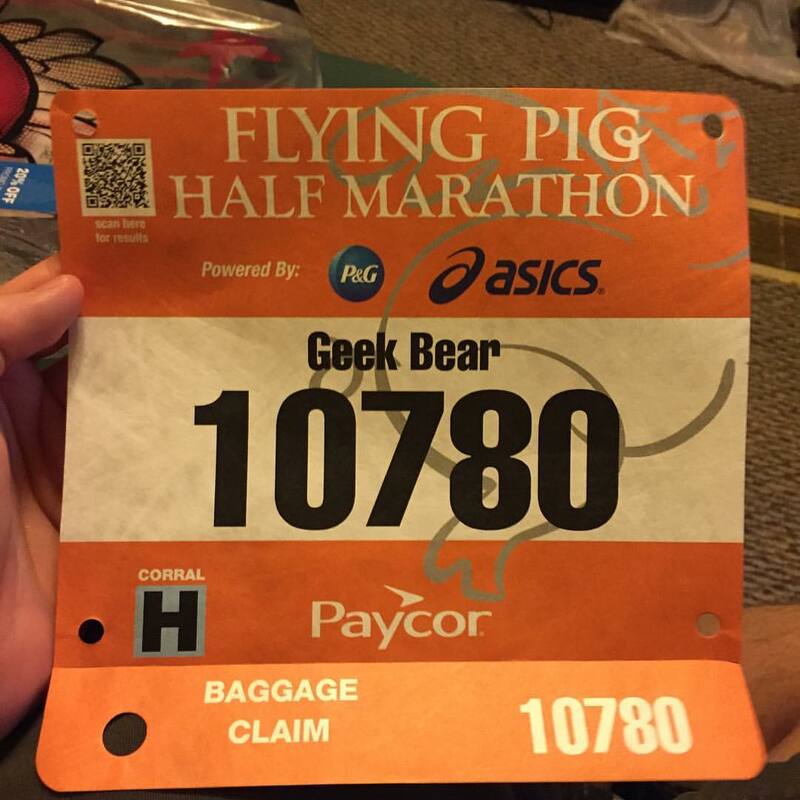 This will be the third year that Geek Bear’s Den will be sponsoring the race. I sponsor it for two big reasons. First, It took me a lot of effort to get to the point that I could run as a means of exercise. I am not the fastest or capable of the longest distance but I enjoy it. I want to make it accessible to all geeks. The Orc Stomp 5K makes everyone feel welcome and appreciated and this is something I appreciate in a run and want to encourage. The charity supported is the Ronald McDonald House. As a child, I had to have a lot of surgeries and they were initially about an hour away from home. It was always a burden on my family about where and who would stay with me during surgeries and recovery afterward. A place that provides this service for families with little or no cost is something that I understand and can support. My sponsorship gives me three entries into the race. This year I was not able to acquire a ticket on my own so I will be using one of them to run the race and have given my second to a good friend. This leaves me with one left. So, here is my plan. I know that the event sold out rather quickly as I myself am using one of my slots. I want to pay this forward though and make this last slot available to another member of the geek and LGBT community. 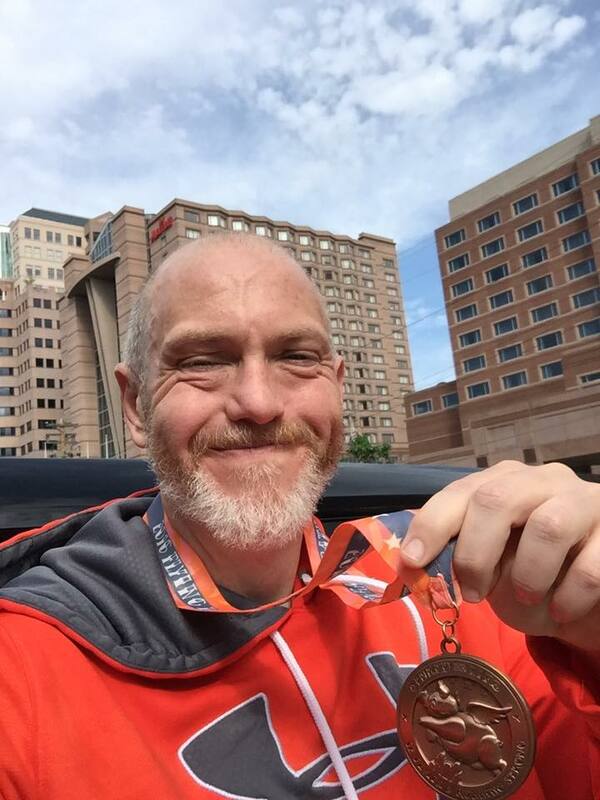 What you need to to be going to Gen Con this year and want to do the Orc Stomp 5k. Then you need to post a comment on this post with your email and what you are looking forward to at Gen Con this year. At the end of two weeks I will pick one person at random and contact them for information necessary to get the ticket set up in their name. Please get the word out that I have a contest running (pun intended). I look forward to running the Orc Stomp with a fellow member of the Geek LGBT community! A little while back I heard about a new book from Marvel entitled Moon Girl & Devil Dinosaur. I was intrigued. I remembered the big red Tyrannosaurus Rex from my early days of reading comics. I knew nothing about Moon Girl but I was in for the first issue. 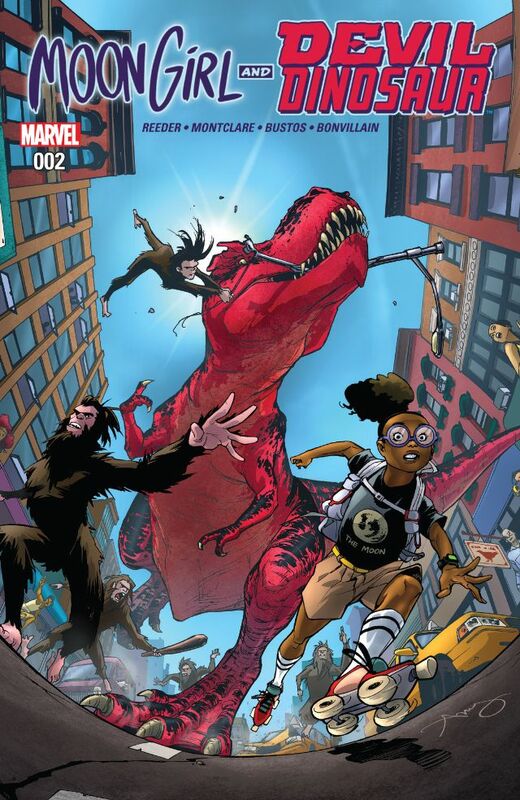 Moon Girl & Devil Dinosaur is currently on issue six and I can not wait for the next issue. It tells the story of Lunella lafayette, A little girl that is too smart for her elementary school classes and gets picked on by her peers. In addition, she carries the genetic markers that would turn her into an Inhuman. With the terrigen cloud swirling randomly about the world, she is seeking a way to cure or protect herself from the change. Devil Dinosaur enters the picture as he interrupts the Killer Folk in the past as they try to use a Kree Omni-Wave Projector. 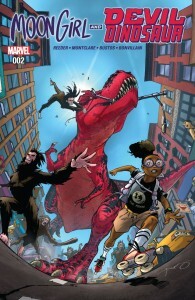 In the fight, Devil Dinosaur, the Killer Folk, and the projector are sucked into the future. What follows are the misadventures of Lunella as she tries to acquire the Omni-Wave Projector in the hopes of saving herself from a terrigen-triggered transformation. There is so much to love about this book. First, Marvel is giving giving us another female superhero with their own book! Lunella is a super genius. She recognizes the Omni-Wave Projector for what it is as well is consistently bored at school as she is way beyond the lessons that elementary school is teaching. The book shows how she is brave in the face of rampaging red Tyrannosaurus Rex and still struggles to meet the requirements of school and her parents while pursuing her heroic goals. My favorite part was when she finally takes up the role of hero in earnest. She dons her costume and gadgets heads out to rescue Devil Dinosaur. Destruction ensues! Also, I love that Reeder and Montclare are honest in their approach to Moon Girl. Lunella is a brilliant female of color in elementary school and is not challenged. They show how the school sees her as more of nuisance and does nothing to encourage her learning. They also show how her parents are both proud of their wonderful daughter but confounded by her precocity and willfulness. I love how these two make Lunella so self-aware. There is a poignant scene where Lunella is contemplating how smart she is and yet in the Marvel Universe there are so many super-intelligent people that it makes it hard to be noticed. As she ticks them off in her head, she illustrates how male dominated the line up really is. They bring this problem into sharp focus when the Hulk shows up to deal with Devil Dinosaur. He is condescending and dismissive of anything that Lunella has to say and literally lifts her up to end their conversation which enrages Devil Dinosaur. Typical. Finally, this book is filled with beautiful artwork. It captures a sense of wonder and hope. Natacha Bustos does an excellent job of capturing both the world around our two title characters. The backgrounds are drawn in a way that invites exploration of the page. The characters are vibrant, energetic and filled with personality that leaps from the page. The actions sequences are crisp and flow well with the story that is unfolding. Bustos’ art captures the courage, excitement, and joy that is an integral component of this book. 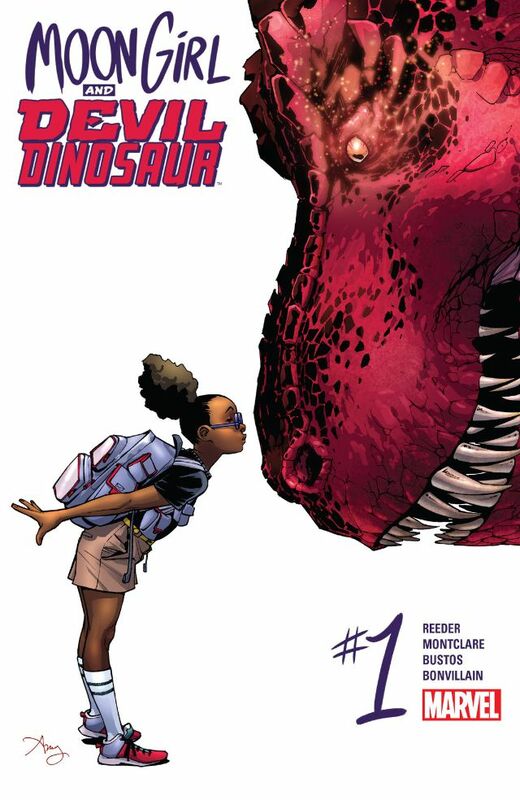 If you aren’t reading Moon Girl & Devil Dinosaur, you should be. It is one of the better Marvel books out there. It captures the hope and fun that used to be the heart of superhero comics without giving up on the deeper issues of the world. It gives young girls and young girls of color a hero that they can identify with as well as saying it is okay to be smart and pursue your dreams. Four bear paws out of four! I love comics. In particular, I love superhero comics. They are the modern myths that sing out to my soul. This does not mean that I do not see the flaws inherent in the system. One of the things that you will notice in comics is a definite lack of diversity. Lots of straight white male heroes saving the day. The female heroes are few and far between. These female heroes are all drawn in a way that their male counterparts are not. So, I remain on the lookout for exceptions to the rule. A recent exception to this rule is Valiant’s Faith. 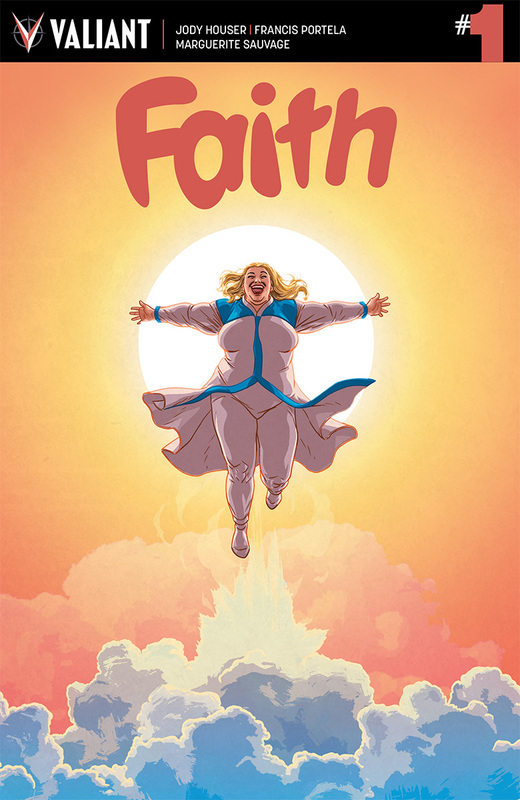 In this title, Jody Houser, Francis Portella, and Marguerite Sauvage give us a look at a female superhero that defies the norms while embracing the tropes of the superhero genre. Faith is the story of Faith Herbert. She was orphaned at young age when her parents were killed in a car accident. She was raised by her grandmother and found solace in comics, science fiction & fantasy, and all things geeky. As a teenager, her latent psiot abilities manifested and she joined a group called the Renegades. Now, she is out on her own and exploring her own life and powers. Faith is a four issue mini-series with an ongoing series planned at the mini-series conclusion. 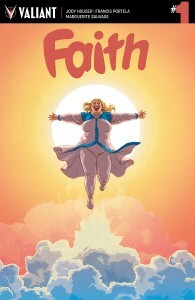 I seriously hope that Valiant does this as I love Faith! 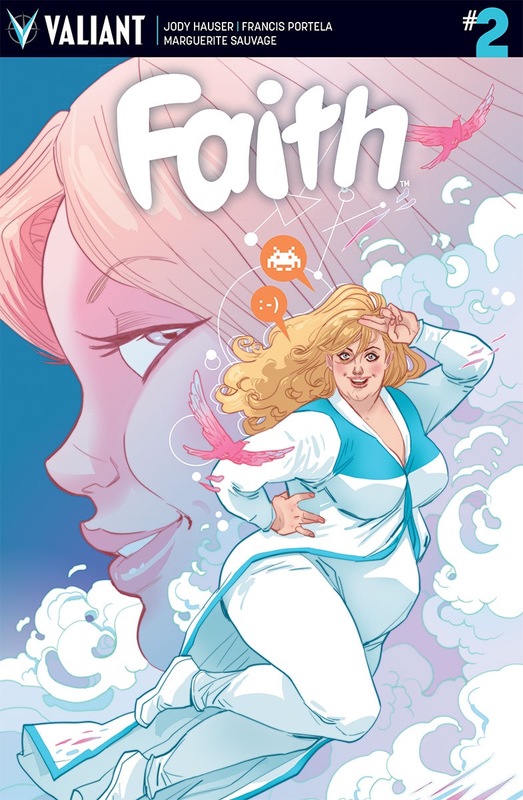 You need to be aware that Faith is a full figured woman which is almost unheard of in the comics industry. When it does occur, the character is always the but of jokes and treated poorly. In Faith, we get to see a woman embracing her own powers and starting to chart her own course. Faith struggles with creating and maintaining a secret identity, dating and dealing with past relationships, as well as bad guys that have no compunctions about trying to kill her. the creative team does an excellent job of making Faith both relatable without being condescending or glossing over the everyday issues that people face. They acknowledge that she has left her group and her boyfriend behind. They have her deal with setting up her own life while still maintaining a heroic identity. They play with the idea of her flirting with her new contacts and trying to find that someone that will fit into her new life. They even bring the ex-boyfriend into the story so that she has to deal with some of the unfinished issues that are hanging about. The art on the book is great. Sauvage and Portella create the feel and look that I enjoy in a superhero book. The lines are clean and the colors are vibrant. She handles action in a fashion that you never lose track of what is going on and it never has a muddy feel to it. The powers on display are handled with care and done in a fashion that you understand what is going on. 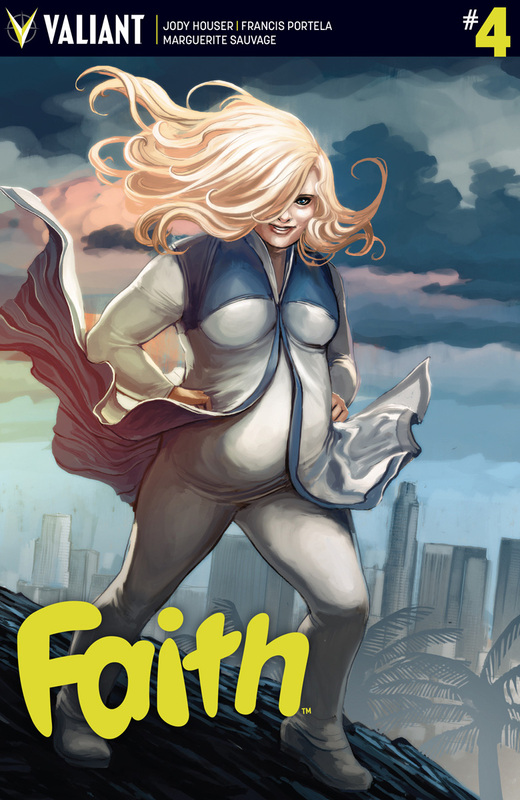 Faith is an excellent series which I recommend you going out and picking up. It is a book filled with optimism which is somewhat lacking in superhero comics currently. The main character is a welcome addition to the heroines whom have graced the covers of comics over the years and one I hope we get to see more of. My fingers are crossed for the ongoing series! I was able to go out and see Captain America: Civil War twice this weekend. 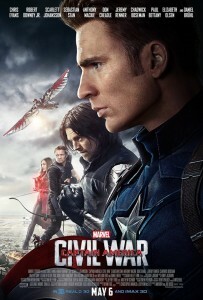 I had been anticipating it’s release as I have enjoyed both of the prior Captain America movies. Winter Soldier ranks as my second favorite Marvel movie. My only concern was about the storyline. I had not enjoyed Civil War in the comics and wondered how it would translate to the MCU. My concerns were unfounded as I loved it! There are many reasons to love Captain America: Civil War. The ones that stood out for me were how it deals with the big issues, great characterization, Black Panther, and all the nice flourishes throughout. In Civil War, the audience gets to see how our heroes deal with the consequences of their actions, the ideas of friendships and loyalty, and staying true to themselves. The operation in Lagos going sideways is where it all begins. In an effort to stop a violent arms dealer, the team engages Crossbones as he tries to get a biological weapon out of the country. He was horrifically scarred during the incident at Sokovia and his hatred for Captain America overwhelms his sense of self preservation. In the middle of a busy market place in the middle of the city, Crossbones attempts to blow himself and Cap into little bits only to have Scarlet Witch whisk him into the air. Captain America and many others are spared but innocents still die and Wanda is devastated by her actions. This destruction has international consequences as eleven of the victims were aid workers from the Kingdom of Wakanda. Tony arrives with Secretary of State Ross who comes bearing the Sokovia Accords. It is a treaty between 117 nations requiring the Avengers to subject themselves to UN oversight and control. Captain America can not see himself giving up the freedom to make the choices necessary in the cases where the Avengers are needed. He also doesn’t want to give up the responsibility that comes with the powers that each of them has. Iron Man sees the Avengers as weapons that have a devastating effect wherever they go. He sees this as a responsibility that shouldn’t be shoulder by the Avengers alone. These two viewpoints create the battle lines that arise in Civil War. There are those that see themselves as weapons that need to be monitored and those that would continue doing the work and taking the responsibility onto their own shoulders. Thus are friendships and loyalties tested. Despite the weight of the material presented, the characters remain true to themselves. Captain America has been set up throughout the movies as both loyal and independent. He does the right thing without the need of orders to make it happen. Cap will also defy orders to do that which is right and that continues to play out in Civil War. Tony is still the egotistical man child but he is undergoing a growth spurt. This transition is leaving him vulnerable and emotionally stretched beyond his capacity. He is still the smartest man in any room that he walks into but his moral compass is clouded by emotional distress that he is under. This idea is particularly highlighted for me in the big tent pole fight between sides. Black Widow and Hawkeye are struggling with each other and Natasha takes the time to check in and ask that they are still friends. Hawkeye answers with a wink, “It depends on how hard you hit me?” The two most grounded members of the Avengers understand that this is just a moment in time that will pass and the important issue is that they still have each other. I also loved how the movie handled all these issues while subtly siding with Captain America. The best example of how the movie does this is with Secretary Ross. Ross was the man who was tasked with hunting down the Hulk. While doing this, he put his daughter in danger, created a monster, and allowed things to get out of hand so that part of Harlem was destroyed. He waltzes into the Avengers to point out to them the destruction which has followed them with the air of self-righteousness despite being the architect of such destruction on his own. In his conversation about the Sokovia Accords he then asks the group about the whereabouts of Hulk and Thor. He then states that there would be repercussions if he lost a 30 megaton nuclear weapon. Ross completely ignores that these two are people and aren’t under arrest so don’t owe it to anyone to make their whereabout known. Ross illustrates Cap’s point eloquently. Black Panther is another reason to love this movie. In the character of Black Panther we get are introduced to a hero without getting his origin. We get to meet T’chala as he accompanies his father, King T’chaka to the Sokovia accords. Despite skipping the origin, Black Panther gets a full story arc told in miniature in this movie. We get to watch as he takes up the mantle of king and vengeance after the death of his father. T’chala gets to show off his powers as he goes up against both Captain America and Winter Soldier in his quest for revenge. We watch as he sees the price of vengeance and power and makes the choice to not be consumed by either. It is a very powerful moment when we get to see him have the true mastermind of his father’s demise at his fingertips. He retracts his claws and refuses to allow Zemo to commit suicide to avoid the consequences of what he has done. Finally, I love this movie for all the little bits that are so amazing that make the whole so good. We get to see every hero on the screen have their own moments. Hawkeye and Ant Man aren’t given as much screen time as the Cap and Iron Man but presence it felt and remembered. Then there is Spider-Man. He too, is given a limited amount of screen time but still shines. Tom Holland does an excellent job of capturing both Peter Parker and Spider-Man in his performance. I love how it blends the Bourne Identity with superheroes with such ease. The chase scene feels like an homage to the Bourne Identity and other spy movies. The transitions to the scene from December 1991 to present day keeps the tension building so that in the final reveal of the awful truth of what happened that day and who knew about it is both a relief and devastating at the same time. There is also the scene where Black widow is waiting to speak to T’chala at his car. One of his royal guards tells her to move or I will move you. This was awesome because Black Panther’s royal guards are the elite warriors of Wakanda and on par with Black Widow. It is a small easter egg that T’chala acknowledges when he says he would like to see that and then has his guard stand down. Also, all the powers on display. Squee! I give Captain America: Civil War four bear paws out four. The acting throughout the movie is top notch, the effects are awesome, and the story is good. It may lean a bit to the dark side with the material covered but this can be forgiven as it makes sure to keep the darkness from becoming overwhelming while keeping hope for a better day alive throughout. Definitely worth seeing at the theater. I know I plan on seeing it at least one more time.